In The Day Fidel Died, intrepid travel writer Patrick Symmes interweaves reporting from years spent traveling to the Cuban Island, a narrative history of the rise of Fidelismo and the last sixty-plus years of life there under Fidel Castro. As the nearest Communist state to the US for decades, Cuba has long loomed in our cultural memory and history. Throughout the last half-century, the island and its larger-than-life revolutionary leader have been key players against us during the Cold War. In 2015, relations thawed, and the country opened its doors to Americans a year later. President Obama arrived too in March, 2016. He was the first President to visit the nation almost 100 years—since Coolidge in 1928. The Rolling Stones played in Havana. And then Fidel Castro passed away in November, marking the end of a momentous era in Cuban history. Symmes’ exploration of the Castros’ Cuba—how it came to be and what it’s become—paints a striking portrait of the nation, its culture, politics and people. Two days before Barrack Obama’s arrival in Havana, I wandered down to the greasy Río Almendares at twilight. There were no soft and sensual banks along here, the spot where Cuban capital’s only real river empties out into the dark blue Caribbean. There were just concrete piers, sagging into the water as if they had been kneecapped with a pistol, mud-colored retaining walls tilted over by the tides, and wooden motor yachts that had gone down right there, still tied to little docks that had themselves collapsed in sympathy. Large areas of the bank were sealed off by locked gates and walls of tin: The boat repair shops and rusting sheds that lined this dank little river were full of motors, tools, and radios. In half an hour of snooping I’d seen mostly old equipment, worn and unseaworthy, but this was Cuba in the age of uncertainty, and every bit of the marine gear would have vanished if left unlocked. Indeed, three lean and mean men in slack polyester uniforms had already warned me off one lot before I wandered onward and found the chicken. Between two small buildings was an open stretch of broken asphalt leading to the Almendares, and out there, on a final slab of tilted concrete, a black man was hunched over, holding a white rooster. He slit the bird’s throat with a kitchen knife. Deep red blood coursed down into the water, which was ebbing fast, toward low tide. The blood flowed quickly, then dribbled, then stopped. A woman at the foot of the slab watched, sang something lost in the wind, handed the man some bills, chatted with him for a while, and left. I watched from a distance until he had cleaned up, and then meandered out. He was young. Strong in the shoulders, with a bandanna over his hair and his bronze skin glowing in the sunset. I was killing time, waiting for a restaurant to open, and he described the ritual for me, which was as simple as it was effective. Sacrifice the bird, say certain things that honored the gods, go home with hope. He was a babalawo, a priest of the Afro-Cuban religion Santeria. He had a big smile, an effortless joy, as he described his career as a mediator with the gods, helping people communicate and seek assistance. What kind of help? “Restoring the love of a husband,” he answered. “Or passing your school exams.” Older people wanted their health back. Some people prayed for others, some for themselves. He obviously loved doing it and felt secure. “People will always need a santero,” he said. The gods were eternal, but human affairs were brief, temporary. “Obama,” he said, as an example. He gave it the dramatic rounded ohhhh that Cubans loved to enunciate. “Ohhhbama,” he said, with a flick of his hand. Obama would come and Obama would go. Politics was transitory compared to other sphere. Even Fidel himself would go away someday. Upstream, the Almendares was a fetid, slow-moving river, curving through a creepy tunnel of green. It was the kind of place where a novelist would leave the body of a murdered transvestite for his detective to find. (Leonardo Padura did this, in Máscaras.) But out here on the slab, the brown water gurgled prettily on its quick way to the salt, and you could see past the abandoned buildings to a wide but featureless slice of ocean. It wasn’t a heroic view of Havana, like in the Vedado hotels, where you saw crashing waves and the snaggle-toothed skyline of the city. But in the gathering dark, when you looked at a sea without lights, there was potential. It smelled of escape, of Gulf Stream journeys and long-delayed returns. The babalawo reviews the week ahead. President Obama would arrive the day after tomorrow. Fidel was officially ninety years old—actually ninety-one—and had been last seen “in the corner farting dust,” as Jon Stewart put it. At the end of the week the Rolling Stones—whose music was once banned in Cuba—would perform a free concert in the sports fields outside the city. He washed his hands, and I pressed him. What had the woman wanted? Usually people asked for blessings, for a return on their efforts. Was the rooster sacrificed for love? For justice? Sometimes people had dark purposes—breaking up relationships, getting revenge on enemies. He acted uncomfortable at betraying the confidence—Santeria involves layers upon layers of secrecy—but then he admitted it was for health. She wanted to protect a family member, someone who was old and weak. More life. The oldest request and the most sincere. He walked off with the dead rooster in a plastic bag, a sack of protein to lift up the next generation. I walked a few blocks back to 11th Avenue and joined a long line for a bar and restaurant called the Fábrica de Arte Cubano. It was cheap, so the line was a rare mixture of Cubans and foreigners. There was a new Havana class here, neat young men and stylish women filing into the art show. They were quietly polite, almost hushed, as if afraid to be thrown out of a refuge that had two-dollar sandwiches and Wi-Fi. Young Cubans had so much education, culture, and aspiration bottled up that it seeped from their pores. There was contemporary art, some of it good, and a fashion show. I watched a few of the Cuban men flirt, shyly, almost nervously, with some American women, language students who gamely struggled with their new Spanish. Sitting outside you could smell the river, and almost hear it hissing out to sea. That was one way to greet an epochal transformation in Cuba’s relations with the world, or to characterize what was essentially a love offensive by the Americans. It revealed the upside-down values that united Maduro and Raúl Castro: Obama rescinding decades of hostility was “pressure.” The flood of businessmen and tourists to Cuba was infernal persecution. The U.S. trade embargo on Cuba was always more fiction than fact, a loophole-plagued set of threats exaggerated by both capitals for political effect (during the supposed “blockade” of the island, Cuba had normal trade with all other nations in the world). But in Maduro’s Venezuela, fiction was normalized. He routinely used the same language to describe a supposed imperialist blockade of Venezuela itself. There was no such blockade against Venezuela, no trade embargo—not even an American policy of sanctions. The $30 billion the United States sent Venezuela the previous year for oil was an obvious contradiction in Maduro’s theory. Venezuela was dependent on these American payments (and the United States, which got about 800,000 barrels from Venezuela, was equally dependent on Venezuela). In Maduro’s mind, the billions sent by the United States were the equivalent of a subversive attempt to overthrow his government. In Havana, such theories of persecution at least had the patina of truth that came from overt American hostility in the past. Maduro, his dark suit freshly decorated with a José Martí medal, slunk out of town twenty-four hours before Obama arrived. Soon it was Obama’s turn to stand in the same spot, in the same dim protocol lobby. The American was given no heroic ribbons or solidarity awards. Obama used the time freed up by that to praise the Cuban band’s performance of “The Star-Spangled Banner.” The joint press conference by Obama and Raúl Castro later that morning was revealing. It would have been routine in another country for two leaders to step before microphones and bat away questions from the press. In Cuba, this was unprecedented, at least for Raúl, who did not do press conferences and preferred public silence. His lack of practice showed to devastating effect. The Cubans had insisted that the presidents should take only two questions at the press conference, one from an American journalist and another from a Cuban. The American journalist, Jim Acosta of CNN, then proceeded to ask a four-part question, a crammed recital of multiple simultaneous if-then queries stacked on top of one another that was almost designed to trigger a panic attack Raúl. It took longer to ask the question (addressed to both presidents) than to answer it, the delay only increased by the fact that Acosta did his own, very bad translation. Born Abilio James Acosta in Cuba, he was one of those children who’d lost his country, and even his native language, thanks to exile and Raúl. Acosta managed to mangle a few phrases of Middle American Spanish, before stammering back into English. Obama was used to this style of dialectical interrogation from a demanding, even petty press corps, and with his usual alertness, managed to offer nominal answers, segue into his talking points on U.S. policy, and also pay the reporter a compliment. Raúl Castro was less successful. Standing stage left to Obama’s stage right, he appeared startled by the detailed nature of the question and the mix of English and Spanish in which it was asked. At one point, Raúl abruptly shoved his earphones aside, as if the translator was bothering him, and then he was briefly flummoxed by his own adult grandson, who often serves as the leader’s “body man” and some sort of cross between bodyguard and protocol chief. He stepped toward the podium as if to help Raúl but merely threw Raúl off. (The exchange was not shown on Cuban television.) Stymied and fragile, Raúl blew off the question and kept trying to step away from the podium, even as the selected Cuban journalist took his turn asking something. After just a few minutes the press conference was over, and Raúl attempted to lift Obama’s arm, like a prizefighter being awarded a victory in the ring. This half-limp salute—the American seemed unwilling—led to an awkward picture of the two men seemingly unable to negotiate between a handshake, a hug, and a salute. It went on and on. Obama’s speech was drowned out by accusations, recitations of American crimes in the early 1960s, lectures on dignity and history, and righteous, mostly sincere, defenders of the Cuban state. Obama went to a baseball game—watching through a side entrance, I saw glimpses of the Tampa Bay Rays easily defeat the Cuban national team—and after four innings the Beast roared away to the airport, Air Force One, and the next presidential diplomatic event, a meeting in Buenos Aires. By Tuesday afternoon, the White House press corps had disappeared, and overnight, the drink prices at the Parque Central Hotel fell by one dollar. The traffic cones were picked up. The city paused for a moment. It felt like Obama had never been here, but by diplomatic agreement, his speech was printed in full in the newspaper Granma. The rest of the paper was given over to critiquing Obama, but there it was, two full pages of the American president’s comments, presented directly to the Cuban people. The whole nation had heard him, seen him. The staff in one of the Chinese restaurants passed around a grainy video, showing Obama’s daughters entering a restaurant. They asked me naive, hopeful questions. Was Cuba going to be different now? I had been surprised by the emotional restraint Cubans showed in the initial moment. A loyalist who worked at the top of the propaganda machine, as the assistant to the head of a television channel, told me she was surprised that Obama was received so well. “We expected people to throw rocks at him,” she said. “Because of the wars and everything,” she replied. Another woman described the surprise and even alarm of teachers at her daughter’s school. When Obama appeared on TV, the students erupted in cheers and began chanting, “OBAMA, OBAMA,” refusing to sit down. Several police cars arrived in a column, but other cars were leaving, including two that held people who had just been arrested. Men muttered into walkie-talkies and scoured the street. An Australian tourist standing to one side told me that a group of Cubans wearing Obama buttons and T-shirts had walked into the park, handing out small pamphlets “a little bigger than a dollar bill. They were chanting pro-Obama stuff,” he said. (A sour American tourist listening to us interjected, “Then they don’t know Obama!”) It had been only minutes, but I couldn’t find a single pamphlet in the gutters. Maybe João had been too cautious. Even now, I realized that dozens of Cubans were holding up their cell phones, filming the scenes. Scores had recorded what had happened. The arrests had been filmed and photographed and uploaded to the Web right there using the Wi-Fi in the park. Within hours an editor in New York had downloaded examples and emailed them to me at the Parque Central. You could see a small group of protesters waving their fists in the air. Cuban cops strong-armed the protesters immediately, but police under Raúl had been retrained to use less visible tactics—sophisticated crowd control techniques including concealment, distraction, embedding plainclothes officers in protests, and using rapid response units of female loyalists, since women look less threatening as they hit and drag away protesters. The police could arrest people in seconds, but even that was too slow for a cell phone camera. Hugo Chávez in Venezuela had given Cuba a new undersea cable for fast Internet connections, a fat pipe to the Web that now felt like a dagger pressed to the neck of the regime. Seventy percent of Cubans had no regular access to the Internet, but 30 percent was enough. Cuba was no longer cut off from the world. 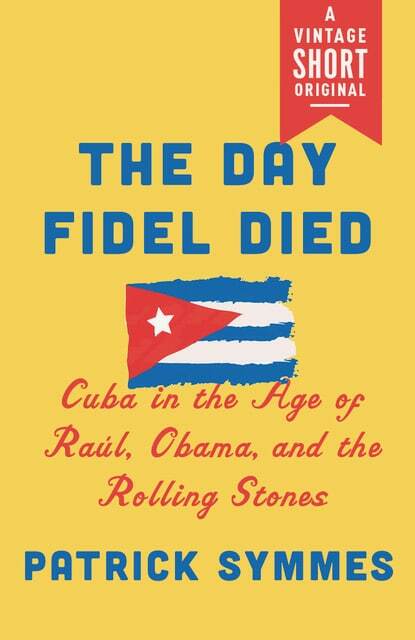 “The Day Fidel Died,” by Patrick Symmes, is published by Vintage Shorts on Oct. 31 as an e-book. An account of driving my motorcycle across South America, on the trail of Ernesto “Che” Guevara, guerrilla icon. As a student in 1952, Che traveled South America for eight months. I retraced much of that trip 44 years later, looking for the same people and places, and visiting some of the other scenes of his youth, his wars, and his death. I found farmers, guerrillas, and professors who knew him. I wrote about the roots of his radical ideas, and the guerrillas who still follow him a generation later. En route I fell off the motorbike, got drunk on moonshine, masqueraded as a priest, shook hands with lepers, and supped with smugglers. My motorcycle trip took four and a half months, through four countries, from sea level to sixteen thousand feet, across deserts and in guerrilla zones. Covering all my obsessions from Shining Path terrorists to Patagonian trout fishing, with liberal doses of ambush tactics and electrical repairs, this book should, at very least, explain what the hell I was doing down there for so long. Chasing Che was published in the US (2000), the UK (2001), Holland (2001), and Italy (2002). Havana! I loved the capital, bitterly and deeply, an unrequited love made possible only by distance and loss. The luminous blue-gray hurricane light. The storm spray that left cars, people, and decaying mansions coated with a white dust of salt. The oily harbor, fuming and ringed with Spanish forts. The blue streak of the Gulf Stream itself, visible from the rooftops every day, a world just beyond. It was “the city where the whole world went to be lied to,” Virginia Piñera said. I found Havana dangerous to body and soul, a high-low environment where you could get arrested for nothing but everyone got away with everything.